The test results provided by 3 independent laboratories were virtually identical, consistent with our in-house results, and are consolidated into single graphs. The shielding effectiveness shown on the right side of each graph shown below is determined by applying the globally accepted formula used to convert the actual shielding effectiveness (dB) to the percentage of shielding effectiveness as presented below. The shielding effectiveness exceeds the requirements specified by ASTM MIL-STD-285, IEEE 299 and Human RF exposure limits as set forth in FCC OET Bulletin 65. 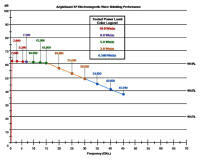 AegisGuard™ L (Life) Series in-house lot sampling tests for models above 30 GHz are always performed to confirm shielding effectiveness and consistency. Independent laboratory tests are currently being conducted, and an updated graph results will be posted upon completion. 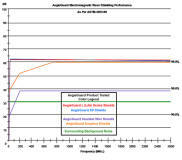 See these AegisGuard LL, LP and LS specification pages for shielding effectiveness results. 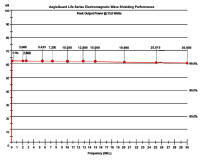 AegisGuard™ L (Life) Series 30 GHz.